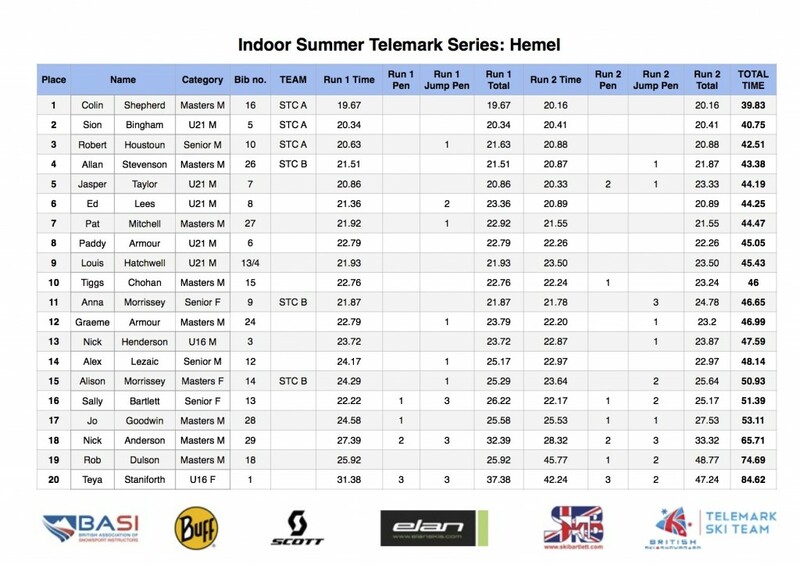 On Saturday, I went along to the Hemel Snow Centre for the last round of the British Indoor Telemark Series. For those that still think of leather boots, cable bindings and long skinny skis when the word Telemark is mentioned, then it’s time to look again. Certainly many still enjoy skiing on that more traditional equipment, but more and more are turning to the NTN (New Telemark Norm) bindings and boots which have a number of benefits over cable bindings, not least that they release like Alpine bindings in the event of a bad fall as well as having brakes, again similar to their Alpine cousins. 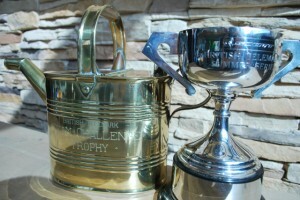 Indeed, all but one of the competitors at the Hemel event were on NTN equipment. 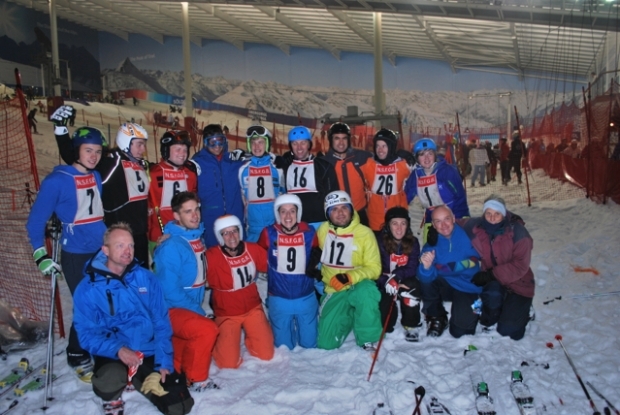 The British Indoor Telemark Series comprises 4 rounds across the UK indoor slopes starting in Manchester in May, visiting Tamworth and Glasgow before this, the final round in Hemel. The format of these Telemark races is a little different to the Alpine disciplines you may have seen on the likes of Ski Sunday. The course involves two slalom sections, separated by a jump and ending with a skating section along the flat. In this case, the finish was actually uphill having negotiated nearly a figure of 8 around the last gate, a makeshift “rap”. Each competitor had two runs with the start order decided by age on the first with the second start order based on their times from the first run. 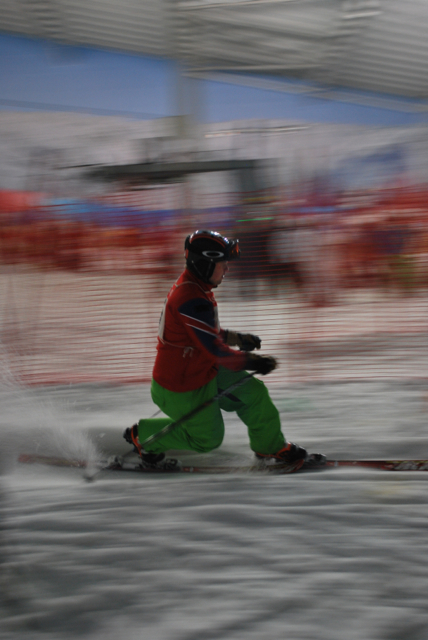 The only significant difference to the majority of telemark races on snow, in addition to it being indoors obviously, is that the final gate is normally a “rap” or banked 360 degree turn which is designed to kill your speed as you enter the skate section. The lack of space and sufficient snow in the indoor environment means that a ‘wigwam’ of gate poles served as a marker around which they raced instead. In addition to being timed, the racers are marked on style through the gates and on the jump. At each gate they are judged and given 1 second penalty if they do not do a smooth transition and do not achieve a boot length between the feet in the lunge. 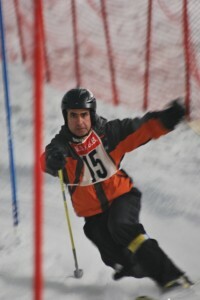 On the jump, there’s a 3 second penalty if they don’t make the distance line (male and female competitors have different lines). There’s an additional 1 second penalty if the landing isn’t in the telemark position. After a few runs to warm up and the course inspection, a few of the racers were commenting on how soft and heavy the snow was compared to the other events. The first run went smoothly with everyone negotiating the course and tricky snow conditions without issue. There were a couple of fallers on the second run, both coming unstuck at the gate after the jump. Despite being a competition, the camaraderie and friendship among these enthusiastic racers was evident, cheering each other on from the bottom when they had finished their runs. 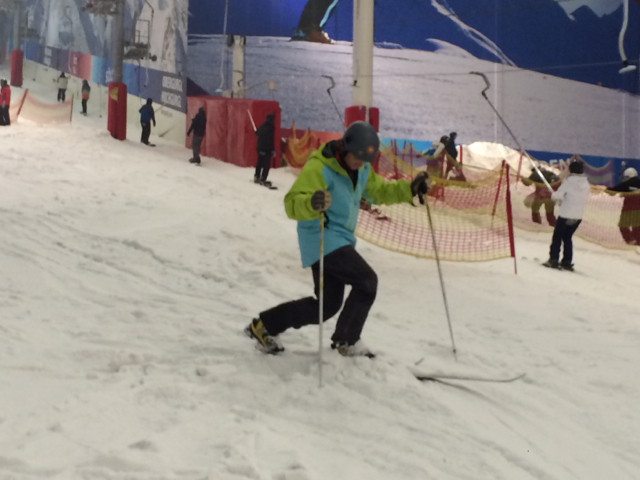 Now, being the only one there who had never tried telemarking before, it was inevitable that I was encouraged out onto the snow with some borrowed equipment for a brief coaching session from Anna Morrissey. The only other time I’ve ‘freed my heel’ is when ski touring and just like those first few steps on skins, you have to restrain yourself from leaning forward. However, unlike a ski touring binding, the NTN equipment has more resistance and is certainly not just a ‘hinged’ toe piece. As your heel lifts, the flex is progressive and comes from both the binding and boot and is certainly something that takes a bit of getting used to. The fact I could walk almost normally in telemark boots hinted that this was going to be very different to what I was used to. Unlike alpine skiing, the downhill or outside ski is the one in front, and you need to keep your weight balanced between both skis, even when in the telemark position. 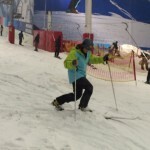 At first the telemark position itself feel stupidly long, but is actually nowhere near as long as it should be. 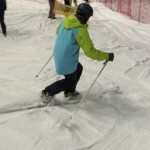 It was only when practicing on the tow, and keeping that ‘boot length’ idea in mind that I got to feel just how long the correct telemark stance should be. After a few runs, I was starting to get a feel and understanding of what I should be doing, but I’m a long long way away from actually doing it. However, telemarking is something I’ve always wanted to try and this tiny taste has only confirmed that I’m going to give it a proper bash sooner rather than later. 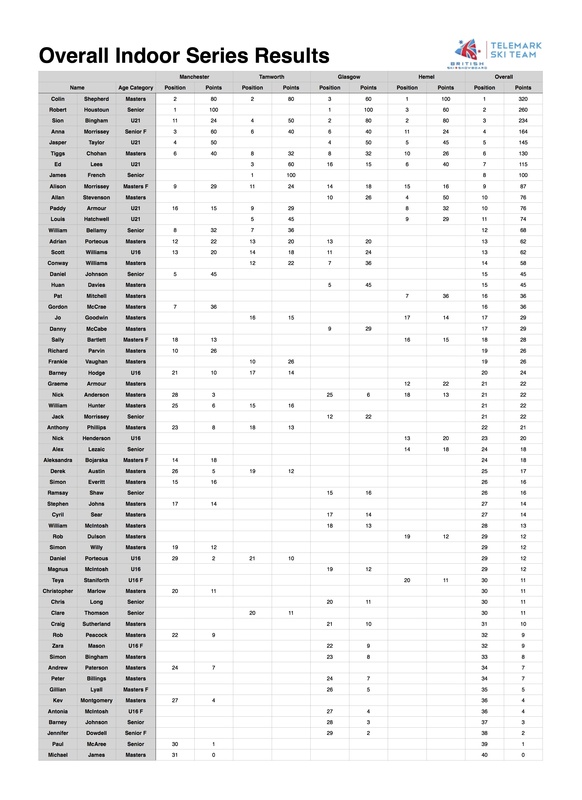 Don’t be surprised if you see more telemarking posts on powpowpow this season.